The oil export ban is an anachronism and needs to be lifted. The original energy security beliefs no longer hold water. We are fast approaching the point at which domestic production augmented with that of the near neighbors Canada and Mexico will serve the bulk of our oil needs. Combine this with the fact that an overabundance of natural gas will inexorably displace oil in many sectors, beginning with key chemicals such as ethylene and derivatives. The most compelling argument until recently was the nature of the oil that we produce. It is light (API gravity greater than 40) and sweet (less than 0.4% sulfur), making it highly desirable to all but the US refineries. This anomalous situation comes about from the fact that most US refineries are outfitted with expensive process equipment to handle heavy crude (API gravity less than 20) often with high sulfur and heavy metals. Heavy crude sells for a discount of 15 – 30% to the benchmark West Texas Intermediate (WTI). So they are loath to pay full WTI price for crude that does not effectively utilize their expensive equipment. The result is that oil from the Bakken has sold in 2014 for a discount to WTI ranging from $5 to $15 per barrel. WTI in turn is selling at a discount to the North Sea benchmark Brent price. In 2014 that spread was between $5 and $12. US refiners love this spread because their raw material is cheaper. They also love the shale oil to sell at a discount to WTI. They are the principal opponents to lifting the crude export ban. A segment of the public believes that oil exports will lead to higher gasoline prices. Since oil is fungible, with a world price, this argument is not viable. However, one could argue that export ban mediated lower cost oil would allow US refiners to produce gasoline for less and pass on that reduction to the consumer. The fly in that particular ointment is that gasoline exports are permitted by law. So refiners will necessarily sell to the highest bidder. In fact, export of US diesel to Europe is believed to be in part responsible for the shutdown of refineries there. This last point brings us to the second reason to consider lifting the ban: possible oil diplomacy. Europe currently imports over 3 million barrels per day (bpd) from Russia, in addition to 14.7 billion cubic feet per day (bcfd). Retaliation for sanctions is likely to come in the form of energy supply tightening. 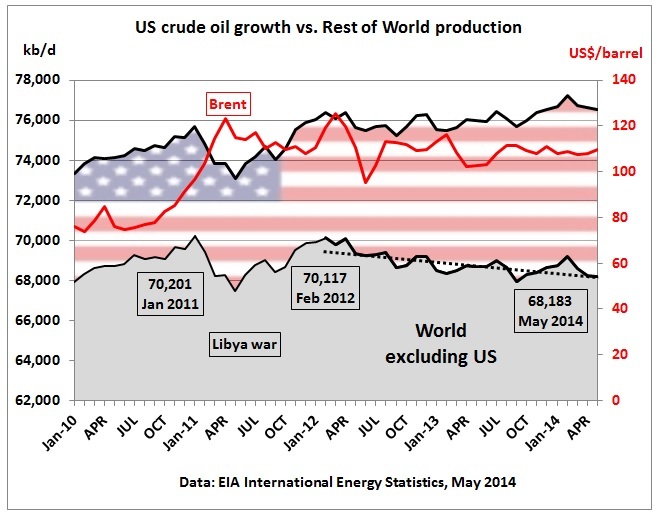 US oil exports to Europe will have two positive outcomes. One is just the gesture of coming to their aid and the corollary benefit that this quality oil is well suited to “simple” refineries, especially in Eastern Europe. The other benefit is to the US GDP. This oil will sell for Brent price, which as we noted before is $10 to $27 over what Bakken oil sells for today. Even at just a million bpd, that results in additional revenue to US producers of up to $10 billion per year. Keep in mind also that US shale oil production has been seeing annual increases of a million bpd for the last two years. The figure reproduced below from Platts is striking. Over the period February 2012 to May 2014 US production increase has single handedly made up for a net drop of 2 million bpd from the rest of the world. While this US production rate is expected to slow in 2014 to closer to 0.75 million bpd, the contribution will continue to be large, and the bulk of this is not suited to US refineries. So the domestic glut of light sweet crude is likely to continue. Exporting oil is good for the economy and a potentially important political gesture at a time when European allies are needed to combat the latest threat in the Middle East. Makes too much sense to actually happen. You ever think about running for president or something??????? I think I may qualify to run for the Energy Optimists Club! Seriously, Secretary of Energy Moniz was already favoring lifting the ban even before this other imperative. So I have hope! You are currently reading TIME TO LIFT THE OIL EXPORT BAN at Research Triangle Energy Consortium.